Economy Adds 142,000 Jobs; Unemployment Steady At 5.1 Percent : The Two-Way The Department of Labor reported the September jobs numbers in its latest report. New jobs fell short of what most economists had forecast. 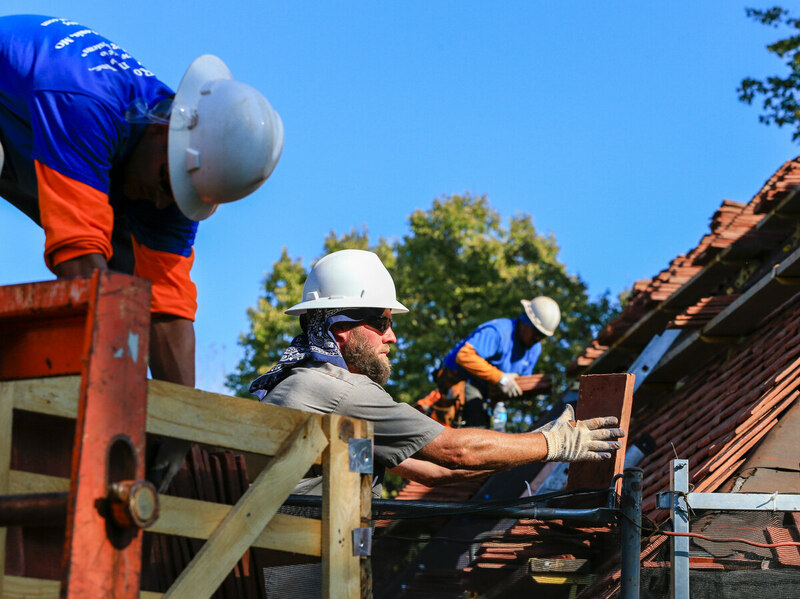 Construction workers lay tiles on the roof of a house in Boys Town, Neb. The U.S. economy added just 142,000 jobs in September, falling short of what most economists had forecast. The unemployment rate remained at 5.1 percent, according to a separate survey. The two reports were released by the Department of Labor. Economists had predicted about 190,000 new jobs were created last month. That would have been an improvement from August's original figure of 173,000 jobs — which was already seen as anemic, and has now been revised downward in today's report to just 136,000 jobs. "I think businesses are being cautious with slower growth in China. The strong dollar is [also] weighing on U.S. exports," PNC Financial economist Gus Faucher tells NPR. "I think businesses are perhaps responding to the downturn in stock prices that we've seen," he said. "That being said, I think the underpinnings of the U.S. economy continue to look pretty good and we should see job growth pick back up again through the rest of this year." "Labor has reported a healthy average of 212,000 job gains a month this year, but advances in August slowed moderately to 173,000 – a drop that many economists attributed to a tendency for initial payroll estimates in August to be undercounted because of seasonal adjustments related to the start of the school year. "A similar, but less pronounced, trend has tempered the first estimates of employment gains in September over the past five years by an average 49,000, says Jim O'Sullivan, chief U.S. economist at High Frequency Economics. As a result, he's predicting Labor will count just 175,000 new jobs in Friday's report — a figure he expects will be revised up by about 30,000 the next two months." The Associated Press notes: "All told, the proportion of Americans who either have a job or are looking for one fell to a 38-year low." -- The average hourly earnings for employees was $25.09, down just 1 cent after August's 9-cent gain. That could be a signal for the Federal Reserve to hold off in the short-term on a change in rates. The Labor Department's Bureau of Labor Statistics says: "Among the marginally attached, there were 635,000 discouraged workers in September, little changed from a year earlier. (The data are not seasonally adjusted.) Discouraged workers are persons not currently looking for work because they believe no jobs are available for them. The remaining 1.3 million persons marginally attached to the labor force in September had not searched for work for reasons such as school attendance or family responsibilities." -- The average workweek for all employees declined 0.1 hour, to 34.5 hours in September. That appears to contrast with the fewer part-time jobs. There were also revisions to July's numbers, originally reported as 245,000 new jobs, was revised downward to 223,000. Sectors that gained jobs last month: Healthcare added 34,000 jobs last month; the information sector gained 44,000; professional and business services added 31,0000. Retail was up by 24,000 jobs and food services gained 21,000. Mining lost 10,000 jobs, in line with a months-long downward trend. "Employment in other major industries, including construction, manufacturing, wholesale trade, transportation and warehousing, financial activities, and government, showed little or no change over the month," the BLS says. "The economy added jobs in September at a pace below that seen earlier in the year, as slowing growth abroad and global financial turmoil have weighed on economic activity. Overall, however, the unemployment rate remains at its lowest level since early 2008 and the private sector has added 13.2 million jobs over 67 straight months of job growth — the longest streak on record. Given the increased uncertainty around the world, it is imperative that the United States not further exacerbate that uncertainty with unnecessary brinksmanship and austerity." At an afternoon news conference, President Obama said, referring to the threat of another government shutdown: "We would be doing even better if we didn't have to be dealing with unnecessary crises in Congress every few months." Congress cannot "flirt with another shutdown," he said, and instead must pass a sensible budget.